37866 Electric Express Powered Rail Car "Red Arrow"
T21337 "Karlsruhe Train" S-Bahn Prototype. T23450 Type DABpbzkfa LNVG bi-level control car "Metronom"
T23451 Type DABpba LNVG 1st/2nd class bi-level car "Metronom"
T23452 Type DBpba LNVG 2nd class bi-level car "Metronom"
T23453 Type DBpzka LNVG 2nd class w/cafe bi-level car "Metronom"
T23454 Type DBdpza LNVG 2nd class bi-level compartment car "Metronom"
T24204 Set with 12 Freight Cars in the Display "Long Henry"
00775 - Set with 12 Freight Cars in the Display "Long Henry"
Prototype: German Federal Railroad (DB) type Fads-50/OOtz high capacity hopper car. Used in unit trains to transport ore between Emden and Rheine. Late Era III. Model: The saddle, frame, and end platforms for the cars are made of metal. The cars have different lettering and car numbers. The load inserts have a layer of real scale sized iron ore. The cars are weathered. Length over the buffers for each car 13.3 cm / 5-1/4", coupled together 159.60 cm / 62-13/16". Each car comes individually packaged and marked. The right add-on for the "Langen Heinrich" / "Long Henry, item no. 26536. Authentic looks with weathering and real ore.
DC wheel set 700580, 4 x per car, 48 x per set. Model: Three of each type of model comes in the package. All of the vehicles come individually packaged, with a plastic base, and a clear plastic cover. 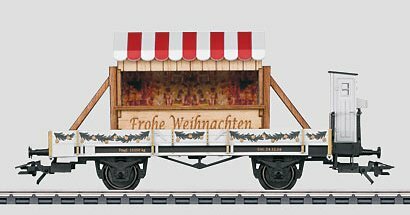 Model: This display package has different sets of figures and freight cars to expand the "Circus Mondolino". The products are contained in an attractive counter display and come individually packaged. Contents: 4 each 00790-01 "Elephant Family" set of figures 1 circus elephant and 2 baby elephants, which can be connected one behind the other. 4 each 00790-02 "White Tigers and Animal Trainer" set of figures 2 white tigers and 1 animal trainer with a ring of fire. The white tigers can jump through the ring of fire. 4 each 00790-03 provisions cars 1 dump car with 2 bales of hay and 3 joints of meat for feeding the circus animals. Length over the buffers 11.5 cm / 4-1/2". 4 each 00790-04 materials cars 1 four-axle low side car with 2 removable containers open on the top. Length over the buffers 16.0 cm / 6-5/16". All of the cars have Relex couplers. And there's also something at Circus Mondolino: 4 small, exclusive expansion sets as small gifts for those in between times. The 4 sets in this displahy package go well with the "Circus Mondolino" starter set, item no. 29411. Video Goggles with an Elastic Headband. The video goggles are powered by a 4.5 volt battery pack (3 each of AAA/IEC LR03 batteries) and have a service life of over 45 minutes on a battery pack. The field of vision is totally sealed by a comfortable foam ring. The images received are projected by 2 LCD screens directly onto the eyes and thereby give the illusion of a movie screen. A built-in gyro sensor controls the direction of the camera in the train by movements of the wearer's head. These goggles can also be connected directly to a DVD player for watching films. A headset included with the goggles gives stereo sound. Miniature Video Camera. This is a high-resolution color video camera with a sender frequency of 3.4 gigahertz. Power for it is picked up directly from the track (digital operation only). The low level light effect is extremely high and is caused by automatically switching to the black and white mode (similar to the human eye). The camera can be adjusted to the desired focus area by means of tweezers available in most stores. ICE 2. Prototype: German Railroad, Inc. (DB AG) class 402 InterCity Express, three-unit train set. Model: The powered end car has a digital decoder. There is one intermediate car and 1 cab control car. The pantographs can be raised and lowered but are not wired to take power from the catenary. Train length 76.5 cm / 30-1/8". AV Cable for DVD Connections. The AV cable enables you to transmit the images sent from the train to a personal computer or a television with an AV input. This cable also allows connections to a DVD player so that you can use the goggles to watch DVD films in a cinema format. Case for Transport and Storage. A high quality case with a foam core for transport and storage comes with Märklin Mobile Vision. The Märklin Mobile Vision system can be transported safely and stored in this case. This opens up the possibility of running on the layouts of your model railroad friends. High-Resolution Video Camera with Low Light Level Effect Amplification. The camera has a transmission range of over 30 meters / 98 feet even when the train is in a tunnel. The goggles are a new design with a closed field of vision for a real "cinema experience" and a movement sensor to control the camera. The camera has an operating period of over 45 minutes. 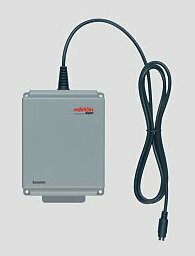 New: Märklin Mobile Vision. The Adventure World of Model Railroading Right from the Engineer's Cab. With the new Märklin Mobile Vision you can run on your model railroad layout right from the engineer's cab. It's real easy, place the train on the track, put on the goggles, and you're ready to go. A high-resolution miniature video camera built into the cab of a Märklin ICE model films your layout directly from the vantage point of the locomotive engineer and sends the images simultaneously to a new design of video goggles by means of the latest video transmission technology. After just a few moments you are immersed in the beauty of your layout, you see details from a totally new perspective, and you ride along as if you were personally in the engineer's cab of the locomotive. The camera transmits very high resolution images at distances over 30 meters / 98 feet, even when the train is in a tunnel, with little low light level effects because in this situation the camera switches to a black and white mode just as the human eye would. This black and white mode generates images even in minimal light conditions that still have a sharp contrast. Another element supporting the reality of the train in operation is the movement sensor built into the video goggles; this controls the camera at the head of the train. A simple movement of the wearer's head to the right or the left causes the camera to turn in that direction also and allows you to see scenery and buildings along the route. The recorded images can be transmitted to more than just the video goggles. They can also be sent digitally to a personal computer by means of an AV cable included with Märklin Mobile Vision. At the computer the images can be cut, processed, and sound can be added. The image received can also be shown on a television with an AV input. Furthermore, a web platform for Märklin Mobile Vision is planned to be opened starting in the spring of 2009. This platform will make it possible for you to use your Märklin Mobile Vision to run on layouts all over the world using this technology. All you will need is a normal DSL connection. 26410 - "Karlsruhe Train" S-Bahn Prototype. Prototype: German Federal Railroad (DB) shuttle train: class 141 248-5 electric locomotive and three commuter cars. Type Abnrz 704, 1st and 2nd class, type Bnrz 725, 2nd class, and type BDnrzf 740, 2nd class with an engineer's cab. Modernized cars from older "Silberlingen" / "Silver Coins" cars. Model: There are electrical connections between the cars and the locomotive, and the power pickup and the headlights / marker lights change between the locomotive and the cab control car, depending on the direction of travel. The headlights and marker lights for the train change over with the direction of travel, will work in conventional operation, and can be controlled digitally. The locomotive has an mfx digital decoder and the new controlled compact design Softdrive Sine high efficiency propulsion. 4 axles powered. 2 traction tires. The locomotive has separately applied metal grab irons. It also has interior details for the engineer's cabs. The locomotive has separately applied roof walks. The triple headlights (maintenance-free warm white LEDs) and dual red marker lights (maintenance-free LEDs) change over with the direction of travel, will work in conventional operation and can be controlled digitally. Electric locomotive operating sounds with the "fire cracker" sound, lights at the ends of the locomotive, and acceleration and braking delay can be controlled with the 6021 Control Unit and with Märklin Systems. The whistle sound and the sound of brakes squealing can be controlled with Märklin Systems. There is a figure of a locomotive engineer in Cab 1. The locomotive has detailed buffer beams. It also has NEM coupler pockets and a close coupler mechanism. The cab control car has triple white headlights (maintenance-free warm white LEDs) and dual red marker lights (maintenance-free LEDs) that change over with the direction of travel. It also has a lighted destination sign that can be controlled digitally with the headlights / marker lights. Total length over the buffers 102.6 cm / 40-3/8". Prototypical changes to the locomotive body: no rain gutters, "Klatte" design vents. The Karlsruhe Train - The Experimental S-Bahn. The use of the much praised class ET 420 was not convincing in the Rhine-Ruhr area. There were longer routes to cover and passengers did not at all like the lack of toilets. The DB reacted to the many complaints by placing a locomotive-hauled S-Bahn train into service. In the mid-Seventies the Karlsruhe maintenance facility developed prototypes for a shuttle train from three Silberlingen / Silver Coins commuter cars. The cars were equipped with swinging-sliding doors with electromagnetic door locks and a permanent entrance that limited its use in the route network since a station platform of at least 76 cm / 30" was a requirement. The interior of the cars was designed to be more manageable and the baggage area was done away with in the cab control car in favor of more seats. The cars were painted in the color scheme for that time of ocean blue / beige, but in reverse, which clearly differentiated the train from the rest of the DB rolling stock. In addition, several standard Silberlinge / Silver Coins cars were also adapted by the Karlsruhe maintenance facility and were used as reserve cars. The Hagen 141 248-5 was selected as motive power, and it was given an unusual, asymmetrical paint scheme to go with the train. It made the train look like a complete unit. In the rough and ready everyday existence of S-Bahn trains the Karlsruhe train was not successful basically because the locomotive did not have enough acceleration. The cars were then put back into normal service rather quickly and the German Federal Railroad used the experience with the Karlsruhe train to develop the type "x" cars, which still form the backbone of the commuter service in the Ruhr area. These cars run in trains of 3-5 cars, usually pulled by the class 111 or class 143. Model: The set has a powerful steam locomotive with a metal frame and a digital decoder. 1 axle powered. Traction tires. The cars have Relex couplers for easy uncoupling. Train length 45.3 cm / 17-13/16". Contents: powerful steam locomotive, 1 low side car, 1 gondola, and 1 stake car, all painted and lettered for the "Circus Mondolino". 2 tigers, 2 elephants, 1 animal trainer, and 1 platform made of sturdy, wear-resistant plastic are included. "Circus Tent" cardstock cutout sheet. 12 no. 24130 curved track, 5 no. 24172 straight track, 3 no. 24188 straight track, 2 no. 24224 curved track, 1 no. 24611 left turnout, 1 no. 24612 right turnout, 1 no. 24977 track bumper, 1 base station, 1 230 volt / 18 VA transformer and a wireless infrared controller. The set can be expanded with the attractive "Circus Mondolino" expansion sets and the entire C Track program. Newly developed, wireless infrared controller with a base station. Hurrah, the Circus is Coming! The "Circus Mondolino" starter set opens up all kinds of play possibilities to children ages 5 and above and at the same time promotes the development of imagination, hand-eye coordination, and technical understanding. With the colorful circus train, different figures, C Track, and a digital locomotive controller, the circus gets moving quickly on the rails and sometimes just in time for the next performance. Curtain up and Clear the Ring for the "Circus Mondolino". The circus is can be played with again and again with a lot of imagination, exciting circus acts, and spectacular wizardry. The endless Märklin track allows the train to go on tour through the entire house. Prototype: Class ER 20 "Hercules". Imaginary paint and lettering scheme as a police locomotive. Model: This diesel locomotive comes in a "police paint scheme" with working blue warning lights and typical German police warning horn sound. The locomotive is constructed of metal with many cast-in details. The total design of the locomotive is ideal for model railroad operation. The locomotive has a digital decoder and a special can motor. It also has a sound effects generator. 4 axles powered through cardan shafts. 2 traction tires. The headlights are LEDs, they will work in conventional operation and can be controlled digitally. The blue warning lights, the warning horn sound, and the acceleration and braking delay can be controlled digitally. Length over the buffers 21.7 cm / 8-9/16". Blue warning lights and warning horn sound can be controlled digitally. One-time series only for Märklin Insiders or members of the 1. FC Märklin. Prototype: German Federal Railroad (DB) class SVT 04 powered express rail car. German State Railroad class SVT 137 "Hamburg" design. Two-part unit with a Jacobs truck. Version in grayish blue / light gray paint scheme of the prototype at the beginning of the Fifties. Model: The rail car train has an mfx digital decoder, controlled Softdrive Sine high-efficiency propulsion, and light and sound functions. It also has a compact design maintenance-free motor arranged in the Jacobs truck. 2 axles powered. Traction tires. The lights are maintenance-free, warm white LEDs. The headlights / marker lights will work in conventional operation and can be controlled digitally. The roof has separately applied details. The powered rail car train has continuous side skirting with covers with side play over the wheel cutouts. It also has a guide mechanism with a closed diaphragm between the car halves of the train. A reproduction of the Scharfenberg coupler (non-working) is present at the ends of the train. Length over the couplers 48.4 cm / 19-1/16". mfx decoder with sound and compact Softdrive Sine propulsion. Lighting with maintenance-free, warm white LEDs. 37886 - Electric Express Powered Rail Car "Red Arrow"
Prototype: Swiss Federal Railways (SBB/CFF/FFS) class RBe 2/4, "Roter Pfeil" / "Red Arrow" in basic red paint scheme, coupled to an SBB type K3 boxcar with a brakeman's cab. The units look as they did from the middle to the end of the Fifties. Model: The powered rail car has an mfx decoder, controlled high-efficiency propulsion, and a sound effects generator. It also has a special can motor with a flywheel and a cardan shaft to the power truck. 2 axles powered. Traction tires. The headlights have the Swiss headlight changeover, will work in conventional operation, and can be controlled digitally. The headlights and interior lights are warm white LEDs. The powered rail car has double arm pantographs with a narrow wiper. There is a special drawbar to couple to the K3 boxcar. The K3 boxcar has a brakeman's cab and comes in reddish brown paint scheme. The sliding doors can be opened. Total length over the buffers 37 cm / 14-9/16". mfx decoder with a locomotive whistle sound. Headlights and interior lights are warm white LEDs. Red Arrows in the Network of the Swiss Cross. The Swiss Federal Railways placed the famous class CLe 2/4 Red Arrows into service at the end of the Thirties. The range of services required of these lightweight powered rail cars extended from express service to regional use right on up to prestigious excursion runs across the Gotthard route. The 7 Red Arrows were all a credit to their name, but with their maximum speed of 125 km/h / 78 mph they were head and shoulders above the rest of the rail services in Switzerland, which had to make do with 100 km/h / 63 mph. The lightweight construction was also trailblazing as was the compressed air mechanism for opening and closing the telescoping sliding doors. The widely spaced trucks and the low-mounted body was designed to guarantee quiet running for these units with their weight of only 33 metric tons. Both streamlined hoods concealed the oil-cooled transformer and the two traction motors wired in series. There were two engineer's cabs in the passenger area, in which the engineer could do his job sitting; the bench next to him provided seating for 2 more passengers, who enjoyed a perfect view down the track. These powered rail cars were initially designed to run alone and therefore did not have the usual coupler and buffer equipment - this equipment was not installed until after World War II so that a lightweight freight car, for example, could go along. Despite expectations that were not completely fulfilled, the Red Arrows quickly became popular with railroad passengers and in some cases, or so it has been told, they were downright stormed. Up to 200 passengers would crowd into these cars, which were authorized for 100 passengers (70 seats and 30 spaces for standees). Mostly due to the excursion runs, they could be seen in almost every corner of the Swiss Confederation and reached a high level of recognition among the public similar to that of the Crocodiles. The Red Arrows underwent several rebuilds during their active service life, new technical features were installed, and they were given new class designations several times; the first unit was retired and scrapped in 1966 as the class RBe 2/4. By 1974 there were 2 units left on the SBB's roster, of which one was sold to the OeBB and was run for several more years in an unusual blue paint scheme. One powered rail car still exists today as an historic unit and harkens back to the time of the Red Arrows in the service of the Swiss Cross. Prototype: German Railroad, Inc./ Railion (DB AG) class 294 heavy switch engine. The unit looks as it did around September 2006. Model: The locomotive comes with an mfx digital decoder mfx, Telex couplers, and controlled Softdrive Sine high-efficiency propulsion. It also has a centrally mounted compact design maintenance-free motor with a flywheel. 4 axles powered through cardan shafts. Traction tires. The headlights are maintenance-free, warm white LEDs. The headlights and marker lights will work in conventional operation and can be controlled digitally. The Telex couplers as well as the acceleration and braking delay can be controlled with a 6021 Control Unit or with Märklin Systems. The engineer's cab has interior details in relief. The locomotive has separately applied metal grab irons and handrails. The steps to the engineer's cab can be removed for sharper curves. Length over the buffers 16.4 cm / 6-7/16". Model constructed chiefly of metal. Headlights are maintenance-free, warm white LEDs. Prototype: German Railroad, Inc. (DB AG) class 01 steam locomotive. Museum locomotive of the Nürnberg Transportation Museum as it looked in its rebuilt state. The locomotive looks as it did before the fire in October of 2005. Model: The locomotive has a controlled Softdrive Sine high-efficiency propulsion system, a compact design, maintenance-free motor with an mfx decoder and a sound generator. 3 axles powered. Traction tires. The locomotive and tender are constructed mostly of metal. There is an adjustable close coupling between the locomotive and tender for different curves. A 7226 smoke generator can be installed in the locomotive. The triple headlights change over with the direction of travel. They and the smoke generator that can be installed in the locomotive will work in conventional operation and can be controlled digitally. The headlights are warm white LEDs. There is a close coupler with a guide mechanism and an NEM pocket on the tender. The minimum radius for operation is 360 mm / 14-3/16". Length over the buffers 27.5 cm / 10-13/16". The locomotive comes in a wooden case. The express locomotive with road number 01 150 is being produced in 2008 in a one-time series for Insider members only. In cooperation with the German Railroad, Inc. Märklin is offering all Insider members the opportunity of acquiring this H0 model of road no. 01 150 in an exclusive collector's case and supporting in a meaningful way the rebuilding of the locomotive that was mostly destroyed in the fire of October 17, 2005. The purchase price includes a donation of 25.00 Euros for the restoration of road no. 01 150. One-time series for the Märklin Insider program. The cars have detailed, partially open frames. The side sills on the cards have a flat profile. The trucks are based on the Minden-Dorstfeld type. The cars have separately applied brakeman's platforms. They also have side ladders with a platform. The cars have different car numbers. Each car comes individually packaged and marked. Total length over the buffers 43.8 cm / 17-1/4". New tooling for tank car types with a length of 12.74 meters / 41 feet 9-9/16 inches. Newly developed insulated chemical tank. Can be run on industrial curves 295.4 mm / 11-5/8" or greater in radius. Prototype: 2 German Federal Railroad (DB) type Sgs 693 four-axle flat cars for combination load service. Each car loaded with 2 convertible truck transport units. The cars and loads look as they did around 1992. 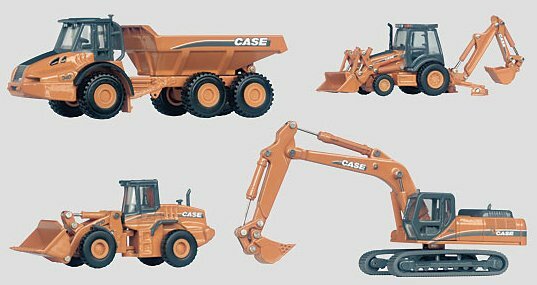 Model: The cars have Minden-Siegen type trucks. 1 flat car comes without brake wheels on the trucks, 1 flat car comes with brake wheels on one truck. The cars have metal, partially open frames. Each flat car is loaded with 2 convertible truck transport units. Stand supports for the convertible truck transport units are included separately. Both cars have different car numbers. Total length over the buffers 45.8 cm / 18-1/6". New tooling for the type Sgs 693 for "Combination Load Service". Continuation of the car family with a length over the buffers of 19.90 meters / 65 feet 3-7/16 inches. DC wheel set 8 x 700580. Model: The car frame has truss rods. There is a Christmas Market stand including load frames made of laser-cut wood as a load. Length over the buffers 11.7 cm / 4-5/8". DC wheel set 2 x 700580. Christmas Market stand made of laser-cut wood. An attractive add-on to the Christmas car series. This is a power booster for large digitally controlled layouts (H0 and 1). It is mfx-capable in conjunction with the 60213 Central Station. It is connected directly to the 60213 Central Station by means of a 9-conductor data bus line. Several Boosters can be used in a system by means of 60125 Terminals. The Booster registers automatically with the 60213 Central Station. The status display for the Booster is shown with an LED on the Booster and graphically in the display for the 60213 Central Station. When a 60052/60055 transformer is used, the maximum power output of 48 VA and a maximum current of 3 amps is available. Dimensions 150 x 110 x 80 mm / 5-7/8" x 4-5/16" x 3-1/8". 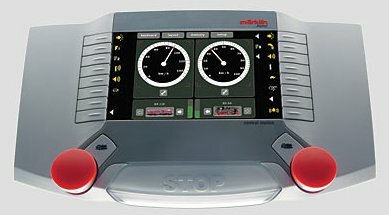 The Central Station combines 2 locomotive controllers for easy, convenient control of locomotives, in addition to a large color touch screen. The representation of locomotives can be done with color images. Furthermore, the Central Station has a built-in Märklin Digital locomotive database as well as 2 built-in locomotive card readers (for saving locomotive data on a locomotive card or for quickly calling up a locomotive by inserting its card in the reader). There is also a powerful booster for providing power to the layout for train and accessory current, 20 Keyboards for controlling up to 320 solenoid accessories, a track diagram control board as well as a route controller (including shuttle train control), all of this built into the Central Station. The Central Station can be used in multiples, i.e. with the optional cable (60123) several Central Stations (60213) can be operated together on a layout, whereby one Central Station acts as the master controller, and the others act as slave controllers. The Central Station has a built-in USB host (for a mouse, keyboard, or USB stick) as well as a network connection. Maximum load at the feeder track: 2.4 amps, maximum load at the programming track: 1.0 amps, total maximum load: 3.0 amps. Dimensions 320 x 190 x 80 mm / 12-5/8" x 7-1/2" x 3-1/8". Totally new development for a Märklin Digital controller. Built-in Märklin Digital locomotive database. New housing with a central stop button and built-in stylus. Up to 16 controllable locomotive functions. 20 Keyboards for up to 320 solenoid accessories. Built-in track diagram control board. Built-in route control (including shuttle train control). Built-in USB host for a mouse, keyboard, USB stick, etc. Can be used in multiples. Prototype: "Huntsche" large coaling station based on the prototype in Saarbrücken, Germany. Almost identical coaling stations of this type also existed in Munich and Vienna. 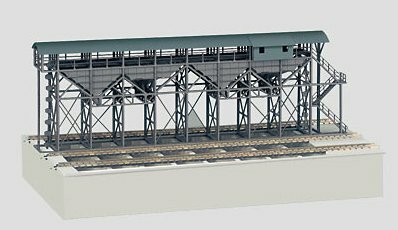 Model: Professional quality model of the "Huntsche" large coaling station Saarbrücken, Germany with all of the parts ready for assembly of the complete model. The parts for the steel framework, the handrails, grab irons, and the walkways are laser-cut precisely from special architectural quality, hard finish card stock. The steps are made of plastic. The underside is cast in plastic and is to a large extent already assembled. The coaling station has working lamps that are already assembled. The center conductor walkways above the coal stacks are constructed of partially open etched metal parts, dark nickel-plated and connected electrically with the center conductor for C Track as a means of supplying power to locomotives. All of the parts are already finished in a realistic basic color, but they can easily be weathered and painted further. Dimensions of the finished model approximately: length 553 mm / 22", width 300 mm / 12", height 223 mm / 9". Can be used for modeling Era I and later. An impressive attention-getter on any layout. This model can be found as a kit in the Trix H0 assortment under item no. 66199. Prototype: Modern railroad grade crossing and station track layout with a storage siding. Model: The set comes with a working automatic railroad grade crossing: The half gates come down when a train is approaching. Contents: A section of track with street pavement, and 2 contact track sections, each 94.2 mm / 3-11/16". 6 no. 24172 straight track, 1 no. 24077 straight track, 2 no. 24612 right turnout, 1 no. 24611 left turnout, 3 no. 24224 curved track, and one no. 24977 track bumper. 32 VA transformer with connections for electric accessories, and wire, plugs, and sockets. A lot of material for a passing siding, a storage siding, and a grade crossing. The automatic grade crossing is easy to install. Dimensions for track layout as displayed: 220 x 76 cm / 87" x 30"
This track extension set is ideal to add to these starter sets: 29852, 29135, 29165, 29755, 29655, 29475, 29533, 29480, and 29790. It can also be used with other starter sets (example: 29575/29576) or added to any existing train setup. Model: This is an exciting beasts of prey number for the ring in the Mondolino tent. Contents: 2 lions, 2 joints of meat, 14 parts for a cage that can be set up as a cage for the beasts of prey in the circus ring or as an enclosure for animals next to the tent. 2 no. 24172 straight track. Cardstock cutout sheet for a "tunnel". Who is brave enough to climb into the cage in ring with the dangerous lions and present great performances? At the Circus Mondolino all of the animals obey the trainer at a word. Model: The complete high wire equipment to go with the Mondolino circus tent, including the high wire performer, who can stand on the wire as well as in the ring. Contents: 1 high wire performer with an umbrella and a counterweight to stand on the wire, 2 masts, 2 platforms, 1 high wire to hook on to the masts, 1 ladder, 2 no. 24172 straight track. Cardstock cutout sheet for a "springboard and a ring of fire". You need a little courage for this too: to balance swaying on the high wire way up in the air without a net and bottom. This will amaze the audience for ever. Model: Different colorful sections of track that will make children want to expand the layout for the train. Contents: 4 no. 24172 straight track in red, 2 no. 24188 straight track in blue, 2 no. 24224 curved track and 2 no. 522920 track end pieces in yellow. Card stock cutout sheet for a "station". Model: This is an old-timer with a Christmas design. Length over the buffers 40 mm / 1-9/16". Prototype: German Federal Railroad (DB) class 44 heavy freight locomotive. Version with oil firing and Witte smoke deflectors. Used for long ore and coal trains. Model: The locomotive has a 5-pole motor. All of the driving axles are powered. The wheel treads and valve gear are dark nickel plated. Length over the buffers 112 mm / 4-7/16". The ideal add-on for the "Langer Heinrich" / "Long Henry" unit train. Model: Professional quality model of the "Huntsche" large coaling station in Saarbrücken, Germany with all of the parts as a finished model. The parts for the steel framework, the handrails, grab irons, and the walkways are laser-cut precisely from special architectural quality, hard finish card stock. The steps are made of ABS plastic. The underside is cast in plastic. The coaling station has working lamps that are already assembled. All of the parts are already finished in a realistic basic color, but they can easily be weathered and painted further. Dimensions of the finished model approximately: length 218 mm / 9", width 118 mm / 5", height 86.9 mm / 4". This is for servicing and presenting locomotives with up to 4 driving axles and coupled axles. It is ideal for models of the class 218, class 185, class 189, class 24, and many other units. It is made of anodized aluminum sections. Four adjustable pairs of roller brackets with precision ball bearings are included. Track is included for positioning non-powered axles. The useful length for the roller brackets is about 120 mm / 4-3/4". The 89933 expansion set of a pair roller brackets is available for using locomotives with more than 4 driving axles and coupled axles. The test stand has train power connections for a conventional power pack. Approximate dimensions 209 x 59 x 27 mm / 8-1/4" x 2-5/16" x 1-1/16". High quality anodized aluminum sections. This is for servicing and presenting locomotives with up to 8 driving axles and coupled axles. It is ideal for models of the class 218, class 185, class 189, class 24, and many other units. It is made of anodized aluminum sections. Four adjustable pairs of roller brackets with precision ball bearings are included. Track is included for positioning non-powered axles. The useful length of roller brackets is about 180 mm / 7/32". 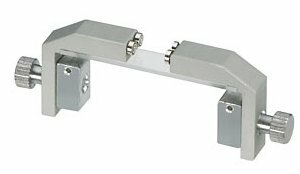 The 89933 expansion set of a pair roller brackets is available for using locomotives with more than 8 driving axles and coupled axles. The test stand has train power connections for a conventional power pack. Approximate dimensions 269 x 59 x 27 mm / 10-19/32" x 2-5/16" x 1-1/16". This is an individual, adjustable pair of roller brackets with precision ball bearings. It is for adding to the 89931 and 89932 roller test stands to allow locomotives with one more coupled axle. Guide slots and set screws are included. T21337 - "Karlsruhe Train" S-Bahn Prototype. T23450 - Type DABpbzkfa LNVG bi-level control car "Metronom"
T23451 - Type DABpba LNVG 1st/2nd class bi-level car "Metronom"
T23452 - Type DBpba LNVG 2nd class bi-level car "Metronom"
T23453 - Type DBpzka LNVG 2nd class w/cafe bi-level car "Metronom"
T23454 - Type DBdpza LNVG 2nd class bi-level compartment car "Metronom"
T24204 - Set with 12 Freight Cars in the Display "Long Henry"